We’d love your help. Let us know what’s wrong with this preview of Supernatural Academy by Jaymin Eve. Maddison James is about to discover some truths about the world. Secondly … she is one, even though no one seems to know exactly what kind. Well, things just got a little more interesting. The Supernatural Academy is where shifters, vampires, magic users, and fey are educated. Where the Maddison James is about to discover some truths about the world. 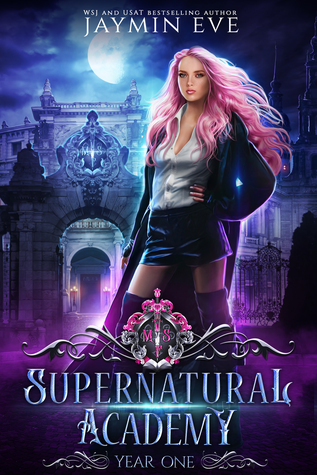 The Supernatural Academy is where shifters, vampires, magic users, and fey are educated. Where they are taught about their abilities, and how to function in the human world. Maddison already has the human part down, but this supernatural thing is an entirely new dangerous game. Example one: mean girls who can actually turn you into a frog. Example two: Asher Lock, a god at the Academy. Not literally … well, who knows for sure. He certainly acts the part, as do all of his minions who worship him. Asher drives her crazy, because apparently snarly, gorgeous, and arrogant is her thing, and despite their mutual dislike, sparks fly between them. The more they’re thrown together, the more Asher is determined to figure out what’s been blocking her abilities. To ask other readers questions about Supernatural Academy, please sign up. is this a reverse harem book? Harmony i don't think it is cause it wasn't tagged in the genre and it only talked about one guy in the blurb. So much fun to read! I absolutely loved the characters. Bounty hunter ends up falling for the enemy, the enemy turns out not so bad. Action, weirdness, and fun!